In your younger years, you didn’t get much say in your living area’s décor. Most likely, your mother’s tastes determined your childhood bedroom’s style, perhaps with a little bit of input from you. If you moved away to college, there were guidelines and size restrictions limiting your dorm room’s design. Post-graduation, you were probably more focused on getting a head start in the working world than decorating a home. But life moves quickly, and before you know it, you’re all grown up, you support yourself and now it’s your turn to decide how your bedroom is going to look. Creating a grown-up bedroom doesn’t have to mean spending a lot of money, following the latest trends or buying an entire set of matching furniture. The number one guideline to decorating is to follow your heart, and that’s especially true in the bedroom, your refuge from the demands of the day. But still, there are certain characteristics that turn a bedroom into a truly master bedroom. Here are seven items every grown-up bedroom needs. You’re old enough to deserve good quality sheets that match, feel soft against your skin and are free of stains and snags. If you are still making do with a mishmash of sheets that bear no relation to each other, it’s time to buy new bedding that not only goes together, it also goes with your entire bedroom’s décor. They don’t have to be super expensive, and they don’t even have to be sold as a set – but a master bedroom’s sheets are comfortable, and they match. Once you pass a certain age, it’s time to give away blowup beds, futons and old mattresses that sag in the middle. Adulthood – particularly the adult back – demands a good-quality mattress that gives proper support to your whole body. A new mattress can make the difference between a restorative night’s rest and an achy, draggy day of fatigue. Every bed needs a bedside table, or even better if you have the space, two. That doesn’t mean those tables have to match, or even technically have to be tables. There are many items that repurpose beautifully as nightstands. But a grown-up bedroom has some sort of furnishing next to the bed that not only visually anchors the mattress in the room, it provides a surface to hold a lamp, reading materials, glasses, a cup of tea or a box of Kleenex. If the only source of light in your bedroom is a small ceiling fixture, your room isn’t a truly grown-up space. Just as every bedroom needs a bedside table, every bedside table needs a bedside lamp, or a sconce affixed to the wall over that bedside table. Ideally, a small bedroom should have at LEAST two sources of light, and a larger bedroom should have a minimum of three light sources – but one of those light sources needs to be right next to the bed. Are your bedroom walls bare and bleak? Empty walls make a room look sterile and temporary. 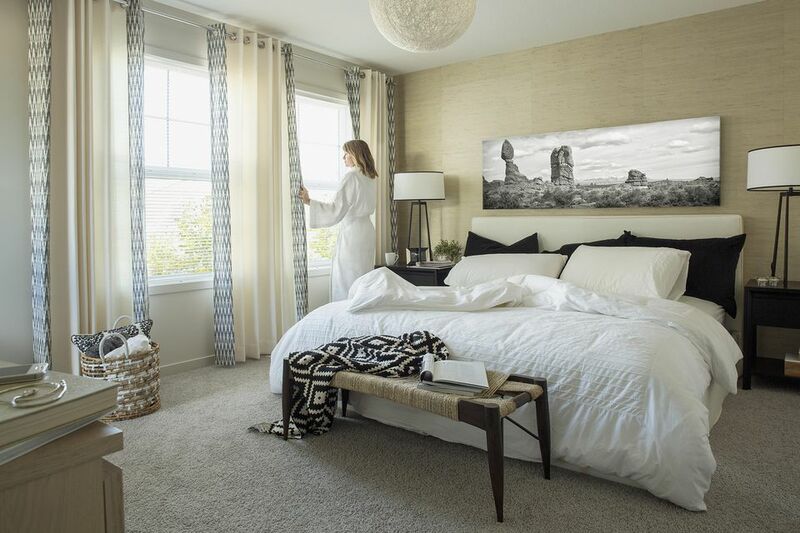 Your bedroom is your home – give it your personal stamp with a piece of large artwork over the headboard or over the dresser, and a few smaller pieces to balance the space. Your artwork might include paintings, prints, enlarged photographs, framed maps or botanical prints, quilts or other textile artwork, or architectural trim – the choice is up to you. After sleep, your bedroom’s next-most important function is dressing room, and every dressing room needs a full-length mirror that allows you to see your outfit from head to toe. Whether it’s on the back of your bedroom door, inside your closet or mounted to your closet door, add a mirror to your master bedroom. While a grown-up bedroom doesn’t necessarily need a matched set of furniture, it should have real furniture. That doesn’t mean no repurposed items in the bedroom – a trunk makes a wonderful footboard and a pair of old shutters look great at the head of the bed – but it does mean that ugly plastic milk crates belong on the service porch, not holding your accessories; that bookcases made from cinder blocks and boards are better left to the dorm room; and that those clear plastic rolling 3-drawer organizers from Target are well-suited to holding craft supplies and toys in the kids’ room, but don’t belong in your adult bedroom. If your bedroom still holds any of those items, treat yourself to a piece of real furniture that makes you feel all grown up instead. You work hard; you deserve it.